Specification grade fixture designed for high performance and maximum efficiency. 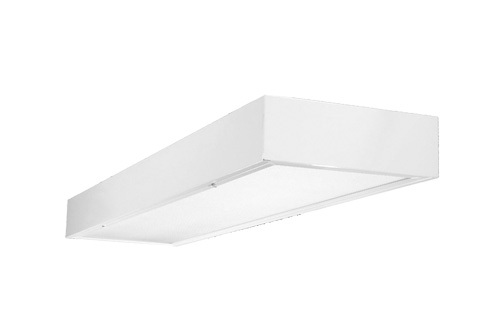 It can be installed in rows either surface or stem mounted to provide excellent, energy efficient general lighting in commercial, retail and institutional environments. - 100% acrylic, clear prismatic pattern #12 lens with nominal 0.100” thickness. Steel door frame allows easy lens replacement without tool. - Unique door frame design delivers a premium extrude appearance. - Door latches and hinges from either side. - Standard door is without gasket flush steel with sturdy tee hinges and opposing, rotary action cam latches. Also available fully gasket door. - Smooth edges for easy handing. - Finish were high-gloss baked white enamel over rust inhibiting phosphate coating for maximum corrosion resistance. - End to end row mounting or single unit installation for both surface and stem mounting. - 1’x’4’ fixture requires at least 2 stems for stem mounting. 2’x2’ , 2’x4’ fixtures require at least 4 stems for stem mounting. - 2’x2’ fixtures can be used with 2 to 4 higher efficiency TT5 lamps.